Ten years ago this week, your agent travelled up through a blizzard – what other kind of weather would await someone daft enough to move to Ottawa in February? – to begin digging a happy little rut in the national capital region. Whether a 'placeversary' is a thing is specious, at best, and at most. Wedding anniversaries are a thing; work anniversaries are a thing. That kind of leaves out a WFHLA on the outside looking in. That is more unfair than the broadcast industry's tendency to give colour commentator jobs to ex-players or people that are, you know, in broadcasting. The form normally calls for some profundity or summary of What Has Changed in 10 years. The world has no need of another second-rate mansplaination about the communications and technological revolution that has made the job I moved to Ottawa for obsolete. How are you going to explain to American hedge fund managers that control the Canadian media that a media outlet needs a last line of defence that is actually vaguely familiar with the market they are trying to serve and sell to, or that making their content whiter, slighter, tighter and politically righter is a recipe for failure in a liberal-left country such as Canada? Rather than dwell on the dystopian nightmare that's good for Paul Godfrey and about nobody else, it might be better to focus on the positive. So as the title implies for both of you reading this, here are 10 Ottawa sportspeople who have made an indelible impression across my decade of being paid (ha!) to watch people perspire in public. It isn't a best-of list. It is a TL;DR waiting to happen and it is the triple-layer red velvet Suzy Q cupcake of pure egotism. (Pro tip: it is better to make the self-referential self-burn.) It is confined to athletes whom I had contact with, or at least Facebook-know. It is light on soccer, most individual sports and anything to do with what passes for contemporary major professional hockey. Johnny Berhanemeskel (Ottawa Gee-Gees basketball guard, 2010-15) – The exemplar of how someone who is determined enough can utilize his five seasons in CIS to become a baller. 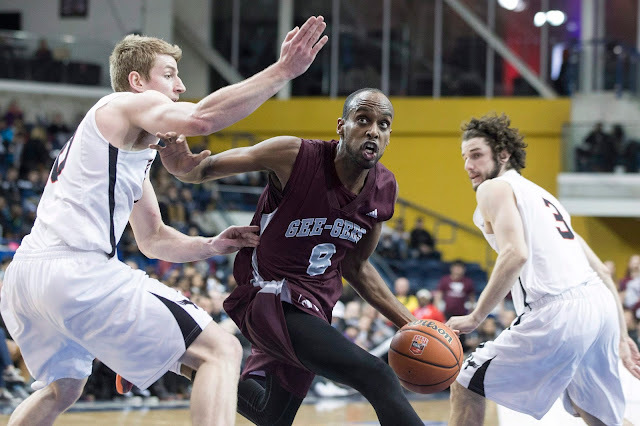 A lithe six-foot-nothin', soft-spoken, but he was the bellwether of Gee-Gees teams that were back-to-back CIS Final 8 runners-up to Carleton in '14 and '15. Johnny Basketball went from being lightly recruited from an AA high school team, Lester B. Pearson – his coach there was Sarah Morris, sister of the Olympic gold-medal curler John Morris – to become a Moser Trophy winner in his fifth season. Hitting a last-second game-winner to defeat Carleton would make most CIS players' career, but Johnny had two over his tenure in garnet and grey. Henry Burris (Redblacks QB, 2014-present) – To spend any time around Smilin' Hank over these past two seasons was to come away with a renewed belief in your own vitality. Football is a young man's game; careers are short. Burris has embraced being on the other side of the generational divide, committed to the bit about being practically old enough to be the father of some of his teammates. He has pulled out every stop to keep his athlete age from being less than his chronological age; the smash therapy, the jock yoga. Watching Burris do his thing makes you want to get off the couch, makes you appreciate your limits. Plus he is the QB on the all-time, all-quotable team. Brander Craighead (Nepean Minor Football alumnus; UTEP Miners, 2009-13; Calgary Stampeders offensive lineman, 2014-present) – Ottawa is a football town, and what is unique about that is that many players develop exclusively in the National Capital Amateur Football Association. An unintended mild consequence of that is talented players sometimes don't get noticed, since Old Media still tweaks to covering high school sports. Craighead, who started for the 2014 Grey Cup-winning Stamps, became a feature story by accident during the Sun days. I was writing a feature on the high school lacrosse league when a coach casually mentioned he had a 6-foot-6, 260-pound player who was going down to Fork Union Miltary Academy to play prep school football. Brander was a joy to interview, and he was overjoyed to be interviewed, since offensive linemen who only play NCAFA don't tend to get many clippings. Margarita Gorbounova (Para-skier, Vancouver 2010 and Sochi 2014) – The psychologist rule about not practising on family seems to apply to sports writing. Writers are always selling out someone. Plus there is a fear of not doing their story justice. Ms. Gorbounova is the spouse of my childhood next-door neighbour and close friend Cliff Martin. In mid-2013, during the months before the Sochi Paralympics, Cliff's sister and Margarita's and my mother's very close friend, Tanya Martin, contracted esophagus cancer. The last six months of Tanya's life affirmed her impact on other people. I don't want to overshare too much of what is private to private people, but you can guess how hard it was for Cliff's close-knit family to say goodbye to their only daughter, who died exactly three weeks before Christmas 2013. For Tanya, for Margarita, for Cliff, for everyone in Bath and Napanee whom Tanya touched in her 35 years, I broke that rule. It came out pretty well. And Margarita nearly earned a medal in Sochi. Thanks in large part to being in Cliff and Margarita's circle, I have got to know a few blind sportspeople. For that, I am grateful. Sean Monahan (Ottawa 67's centre, 2010-13; currently with Calgary Flames) – Monahan's first OHL season was my first full season covering the league, so we were rookies at the same time. Championships have been elusive for the 67's since I got here – feel free to point the middle finger in my direction – but they have had a succession of future pros who had it as 16-year-olds. Logan Couture. Cody Ceci. Travis Konecny, mark our words. Monahan looked like a pro from the get-go, an absolute steal as a No. 16 overall choice in the OHL priority selection. By the second half of his first season, coach Chris Byrne had him on a top line. Monahan was advanced at initiating an offensive rush with a lead pass and then practically teleporting to the front of the play for the return pass before sniping a goal or making another feed for the primary assist. Monahan was given to shyness and short answers; the @BoringMonahan Twitter was pretty much spot-on. That's often the case with top prospects; part of is being agent-coached to say little, and part of it is making sure they know their place. Sean, if not so much in words, did show his character with the way he held eye contact with older writers, and talked about his teammates. For instance, at the NHL Scouting Combine in the spring of 2013, I was there to interview as many players as possible, mostly those who hadn't come through Gatineau or Ottawa during the season. I didn't need to talk to Sean, but when he came out for his media availability, he spotted me and former 67's radio commentator Jon Abbott, and walked over to shake hands. Not many 18-year-olds do that. It was hardly a shock that he went directly from being drafted No. 6 overall in 2013 to making the Flames. He might have done it a season sooner if he had made the age cutoff to play in the NHL in '12-13. Petr Mrazek (Ottawa 67's goalie, 2009-12; currently with Detroit Red Wings) – The moniker Mrazician never caught on, alas, but he was a fun watch for three seasons in Ottawa. This was in the innocent days before the Canadian Hockey League wrongheadedly decided to ban goalies from the import draft, letting you, the career house league ankle-burner, know in no uncertain teams that believing European goalies enriched the CHL was a treasonous notion. Import players typically need a full season to get comfortable with the league, and the language. Mrazek wrested the No. 1 job in Ottawa by the end of Year 1. By the start of his age-19 season in '11'12, he was a self-possessed goalie, almost fully North Americanized. Tom Dempsey, who is now Carleton's goalie coach, predicted he would be in the NHL, which he would be within 18 months. Then came the world junior in Edmonton. Czech hockey federation politics kept Mrazek out of the 2010 and '11 tourneys. Finally given a chance, he adopted an almost Cam Newton in pads persona. It was as if he was challenging the Czech team to realize they belonged. There was the fist pumping after he robbed future Senators forward Mark Stone during a 5-0 defeat against Team Canada, which might have been 11-0 if not for him. As the one writer who saw him play regularly in the OHL, I was asked, "Is he like that in Ottawa?" I replied no, this was different; he was trying to rally his troops. The Canadian players were aggrieved by the celly-ing; I recall Brendan Gallagher making some thinly veiled snide comments. The Team Canada players, in the thrall of the jingoism that is the WJC, couldn't contemplate the notion that hockey politics had reduced Mrazek to only one opportunity to play in the tournament. Or that there is a slight discrepancy in how many resources Canada, as opposed to an Eastern European country, can put into an under-20 hockey tournament. The reception toward Mrazek, of course, changed after he made 50 saves in a 5-2 Czech win against Team USA. He gave the Yanks a severe case of gripthestickitis and had fans eating out of his hand. On top of all the 10-bell saves, there was the emoting, the delirious dog-pile on to his teammates in front of his bench after a third-period dagger goal, and he almost scored an empty-net goal. The Czechs lost in the quarter-final to eventual silver medalist Russia, but Mrazek made that tournament, picking up the Top Goaltender Award. And he even saw some humour in it the morning after the gold-medal game when he strolled into the boarding lounge before a Calgary-Ottawa flight and spotted a journalist rocking a Sweden jersey. Courtnay Pilypaitis (Vermont Catamounts basketball guard, 2006-10; Canadian Olympic women's basketball team, 2012) – It is always flattering to a sports scribe's ego to believe you got to something early. One point of emphasis while writing a once-a-week feature for the Sun was to give more coverage to female athletes, because it was 2007. That meant writing a feature on Pilypaitis in her sophomore year when she was the Catamounts' leader in scoring, rebounding and assists simultaneously. A year later, the Ottawa media started paying attention when she led the mid-major to successive NCAA Tournament berths in her junior and senior seasons. Being big-time interested in basketball below the NBA meant taking an avid interest in how Canada's national teams fared each summer during the FIBA season. It would probably be embarrassing to confess to how many hours were spent watching streams or refreshing a live scoring page. In the summer of 2012, before it was cool for media people care about the senior women's national team, and before a place where I used to write started giving all the Canada Basketball coverage to millennials who wouldn't know Chris Critelli from Chris Campoli, I committed to covering their run at the last-chance London 2012 qualifier. Canada didn't have a singular talent like Kia Nurse yet. They scraped through – "Canadians always have to do it the hard way," was Kim Smith Gaucher's summation after one loss – and Pilypaitis came through hugely in the win on Canada Day that sealed the Olympic berth. One would have thought that the first Canadian team, female or male, to qualify for the Olympics in three quadrennials would have been a big story. It was, though, a holiday, and some NHL team had probably just overpaid for a middling free agent. Four reporters – Mike Koreen, Gary Kingston, Doug Smith and one other guy – made the effort to call in to talk to coach Alison McNeill and Pilypaitis, who had been the woman of the hour. That Olympic qualification might not have rated top billing that day. Without it, though, the SWNT would not have had the profile that led to them hosting and winning the FIBA Americas championship in 2015. Pilypaitis helped make that possible. Brad Sinopoli (Gee-Gees football, 2007-10; Ottawa Redblacks 2015-present) – Whether as No. 12 throwing passes, and breaking tackles, for the Gee-Gees, or as No. 88 catching passes, and breaking tackles for the Redblacks, Sinopoli is a price-of-admission playmaker. He's also down to earth. On Friday, as part of a promotion at a 67's game, Sinopoli, Burris and guard Alex Mateas were still signing autographs and posing for photos 30 minutes after the final buzzer. It has been cool to have had a good perspective for both incarnations of Big Brad. He had more highlight plays in his two seasons as the Gee-Gees quarterback than some other all-Canadian QBs amass across five. There was the time he turned a fouled-up field-goal attempt into a rushing touchdown on third-and-28 against Laurier. In '09, he averaged more than 10 yards per carry, as a quarterback. In 2010, his Hec Crighton season, there were fourth-quarter comebacks to defeat Western, Queen's on the road, McMaster, and Laurier in the playoffs. So in other words, he pulled out wins against all three OUA programs that went to the Vanier Cup within two seasons on either side of that fall. If not for Lirim Hajrullahu's field goal that gave Western the Yates Cup, those Gee-Gees would have played Calgary for the Vanier. Who knows what the over/under on quarterback rushing totals would have been in an Erik Glavic vs. Brad Sinopoli showdown. Now Brad has reinvented himself as a 1,000-yard receiver for the Redblacks, who have this city in thrall with a new team that's fast become a winner. Sinopoli provided plenty of entertainment during the years when there was just the one OUA team to represent the city in Canadian football. Stu Turnbull (Carleton Ravens basketball guard, 2004-09) – The historical bridge between the five-in-a-row Ravens of Osvaldo Jeanty and the other five-in-a-row Ravens of Phil Scrubb and Thomas Scrubb. Personally, since Dave Smart is a fellow Kingstonian/Napaneean and many of his early Carleton teams had a lot of Kingston content, the Ravens were an entry point for my becoming as alt.nerd.obsessive about Canadian university basketball as football. Being on the periphery of the fringe of Kingston basketball circles in the mid-1990s meant being early to knowing about the Smart genius for developing and organizing basketball programs, which was very much 1 per cent inspiration and 99 per cent perspiration. To rip off some of Gord Downie's lyricism, he was a dynasty "looking for a place to happen." One day in spring 1999, an associate at The Queen's Journal called Smart "the Mike Keenan of the CIAU." I replied that Carleton would win a national title in the next five years. I was wrong. Within a half-decade, they already had two. There should be a statue of Smart. Not outside the Ravens' Nest, the facility Carleton built once the CIS banners started to roll in, but outside the ARC at Queen's, where he played. The inscription should read, "Don't ask why we didn't hire him," then list all the championships. Sorry, not sorry Queen's. I came to town toward the tail end of the Jeanty era. In 2007-08, the Ravens won their first 31 CIS games going into the Final 8 in Kanata. The underlying question, with Oz gone, was who would be their closer with the game on the line. Before the nationals, I was interviewing Aaron Doornekamp, and looking back, I was a little too infatuated with the ex-Ernestown Eagle angle on the story, of how someone went from being a 6-4 wing out of a small high school to a thickly built 6-8 combo forward and CIS player of the year. At one point, Doornekamp mentioned, matter-of-factly, "none of us could replace Oz." That didn't get into the story, since it didn't serve a preconceived narrative. That turned out to be prescient after Carleton fell 82-80 in double overtime to Acadia in the national semifinal. Acadia shot about 55 per cent (probably 65%-plus in effective FG%) in the second half and overtimes. Carleton shot in the 30s, and yet had the last shot at the end of regulation and the first OT When time ran out, Turnbull went right over to do a post-game interview with CKCU-FM, the Carleton campus station. It was a very professional move from an amateur athlete. In 2008-09, the best team in CIS was the Western Mustangs, bar none. Weeks before the nationals, Greg Layson, now of CBC Windsor, said Western would be the best team at the Final 8 and the Ravens would outmaneuver them. Then Stu made that buzzer-beating pull-up over Mustangs guard Matt Curtis for a 66-65 victory on Semifinal Saturday. Mark Masters and I, doing commentary for the webcast, had a perfect view of a Shot 'Heard Round Canada that was so dead-on that the netting barely ruffled as the ball tumbled down the cylinder, which meant you heard Stu scream out in triumph before 8,000-plus people went from mute to 11. Meantime, I almost bit through my tongue to make sure I didn't say anything to interrupt Mark's call, which was just as impeccable. It was just an ultimate gamer moment. Turnbull played the full 40 minutes that night. I recall him slumping on the media table whilst doing a courtside interview, accepting a hug from his mother. It was as good as anything you would see in the other March Madness, and more knowable, since CIS athletes are of the student population, not apart from it in classes of dubious academic virtue. Don't ask me anything about what happened about 16 hours later when Carleton beat UBC 87-75 for W.P. McGee Trophy. The Ravens spotted the Thunderbirds a 12-2 lead before the first-quarter media timeout, and they kept making UBC lead guard Chris Dyck go to his left hand on the drive. The rest is blocked out. Krista van Slingerland (Ravens basketball, 2009-12; Gee-Gees basketball, 2014-present) – Ms. van Slingerland's work with Student-Athlete Mental Health Initiative (SAMHI) is going to leave a major legacy. It takes true strength to be open about mental illness. People are more aware about how the struggle is real. There is always the chance that someone – a potential employer, an Internet troll, even a well-meaning person – will not get it, or see it as a negative. It is inspiring, from this vantage point, to follow how van Slingerland has made a comeback across the past two seasons with the women's basketball Gee-Gees after her low times. Her advocacy is going to help improve the student-athlete experience for many, many people in CIS, and that matters as much as any athletic feat. That all circles back to what this post was about: games are about the people within them, not the game itself.